Broadcast news outlets that purport to give health or lifestyle advice have a responsibility to their readers to provide factual, accurate information. At a bare minimum, they should not blindly promote some product or life choice, while disparage alternatives, without covering all the relevant sides of the issue. The editorial team at Forbes and contributor Janet Forgrieve came up short on all scores in a recent piece [Good Catch Touts Tuna That’s Better For the Oceans, Safe For The Office; 2/20]. Forgrieve uncritically accepts the claims made by Good Catch, producers of bean-based products they misleadingly refer to as “seafood”, without giving any space to skeptics. She could have done a simple internet search to find ample information about the well-known health benefits of seafood. Or she could have reached out to us, and we would have provided research on sustainable fishing to refute Good Catch’s unfounded and hyperbolic claims about the “dire situation” in our oceans. 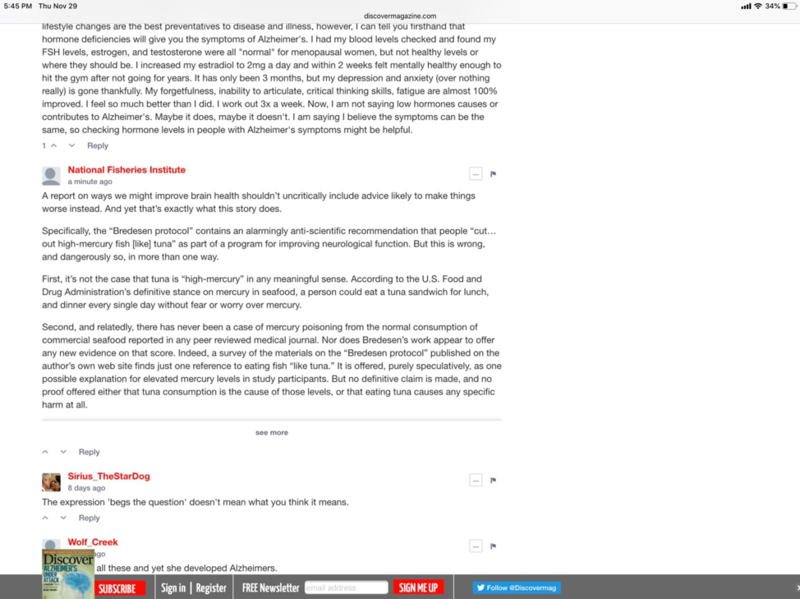 Chad Sarno, co-founder of Good Catch, further makes the completely unsupported claim that doctors tell pregnant women not to eat tuna. This is dangerous rhetoric that contributes to a national public health crisis. Pregnant women need to eat more seafood than the 1.8 ounces per week they currently consume on average, and canned or pouched tuna is a nutritious and affordable option. Mercury content standards for consumer products are already extremely rigorous. The FDA’s recommended limit for mercury in seafood has a ten-fold safety-factor built in. And the FDA’s Net Effects report, which is based on 100 peer-reviewed studies, found that even a pregnant woman could eat tuna for breakfast, lunch, and dinner, every day of the week, without worry. 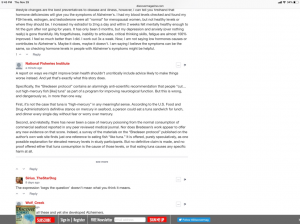 In a world saturated with conflicting and confusing dietary advice there is remarkable expert consensus on one subject: Americans need to eat more seafood. Period. 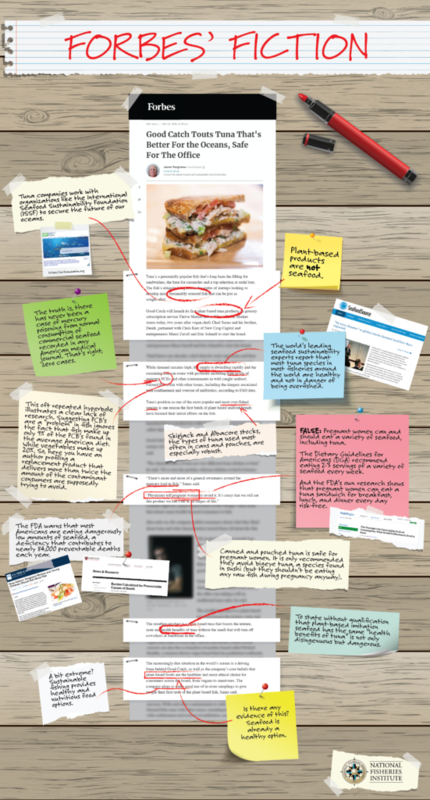 So when click-bait articles pegged to the latest food fad or fringe diet peddle in dusty and debunked clichés about fish and mercury, the result is not just that readers are misled. Their health is actively endangered. 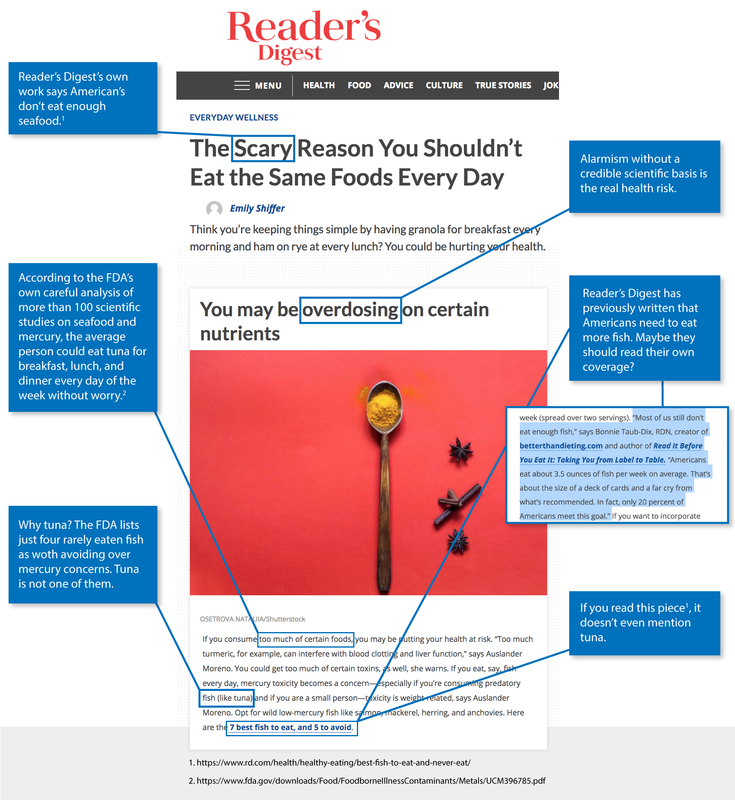 Reader’s Digest’s recent post [The Scary Reason You Shouldn’t Eat the Same Foods Every Day, by Emily Shiffer, 1/23/19] poses just such a threat. 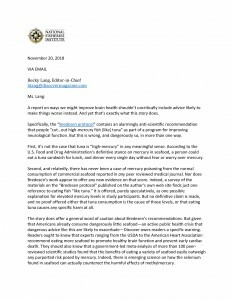 Ms. Shiffer tells readers it’s “scary” to eat too much of the same foods, and singles out tuna as specifically dangerous due to concerns over mercury. But there is no reason to limit tuna consumption due to mercuy, and indeed the only piece she cites in support, written by one of her own colleagues, doesn’t even mention tuna. The truth is that there has never been a case of mercury poisoning from normal consumption of commercial seafood recorded in any American medical journal. That’s right, zero cases. Indeed, the FDA’s own analysis of more than 100 scientific studies on seafood concludes that the average person could eat canned tuna for breakfast, lunch, and dinner every day of the week without worry. But many Americans aren’t getting that message because of click-bait articles like Ms. Shiffers. The FDA warns that most Americans are eating dangerously low amounts of seafood, a deficiency that contributes to nearly 84,000 preventable deaths each year. Another long-term study showed that children whose mothers had reduced their seafood intake during pregnancy had appreciably lower IQs. Other agencies agree that more seafood consumption is needed. The Dietary Guidelines for Americans, for example, urge consumers to eat more fish and recommend tuna as a healthy option. The USDA too recommends that Americans eat at least 2-3 servings of seafood per week. That’s because seafood is rich in important nutrients, such as a vitamins B12 and D, iron, zinc, magnesium, phosphorous, selenium and beneficial omega-3s called EPA & DHA. In the face of such overwhelming scientific evidence, unsupported and unsourced attacks on tuna are especially galling. Reader’s Digest owes its readers more, and we call on them to update their story with the real facts about tuna. Recently Discover Magazine published dangerously misleading myths about mercury in tuna, so we wrote a letter of concern to the editors. After receiving no response from the editorial team, we also posted that letter as a comment under the article to give readers all the facts. To our surprise, it was deleted, multiple times, without explanation. As a magazine devoted to report “developments in science, medicine, technology, and the world around us” it is counterintuitive to us that Discover Magazine would inhibit our ability to present readers with a factually informed perspective, rooted in peer-reviewed research from the FDA, the USDA, and the American Heart Association. Here’s the original letter, and a follow-up we wrote asking for an explanation of the deletions. Yet in response to their initial canned tuna “report,” the FDA released a statement, “[T]he methodology employed by Consumer Reports overestimates the negative effects and overlooks the strong body of scientific evidence published in the last decade.” Consumer Reports false claims that pregnant women should completely avoid canned tuna, while other consumers should stick to light canned tuna, are based solely on their own irresponsible and makeshift study. Leading health officials have long understood and advised that canned tuna is a nutritious food that provides many health benefits. The Dietary Guidelines for Americans urge consumers to eat more fish and recommend tuna as a healthy option. The United States Department of Agriculture (USDA) also suggests that Americans eat at least 2-3 servings of seafood per week. That’s because seafood is rich in important nutrients, such as a vitamins B12 and D, iron, zinc, magnesium, phosphorous, selenium and beneficial omega-3s called EPA and DHA. 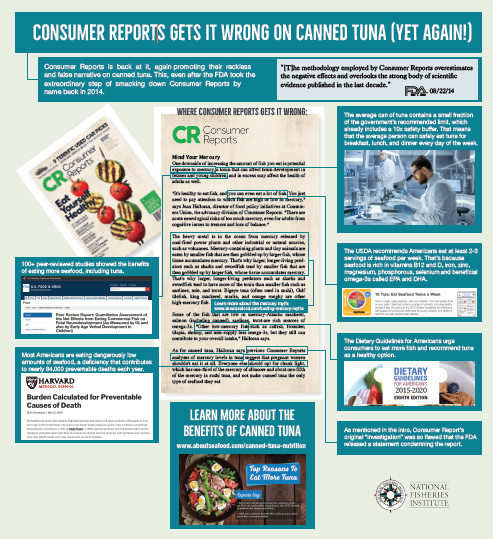 Their statement is especially misleading because the average can of light or albacore tuna has mercury levels of 0.1 and 0.3 parts per million, substantially below the FDA’s safety level of 1.0ppm. That means that, according to the FDA’s Net Effects Report, which encompassed over 100 peer-reviewed studies, the average person can safely eat tuna for breakfast, lunch, and dinner every day of the week. Between the FDA’s admonishment and our constant reminders that Consumer Reports is misleading the public, which we’ve done here, here, here, and here, the magazine has presented no substantive response. Most Americans are eating dangerously low amounts of seafood, a deficiency that contributes to nearly 84,000 preventable deaths each year. Yet Consumer Reports continues to scare consumers away from one of the most nutritious and easily accessible seafood options. Their utter disregard for the accepted and prevailing public health consensus on the safety of tuna consumption is disgraceful. The Sustainable Fisheries Partnership (SFP), in collaboration with Greenpeace, Birdlife International, and The Nature Conservancy, has released a report – Best Practices for Reducing Bycatch in Longline Tuna Fisheries – focused on minimizing bycatch in longline tuna fisheries. Perhaps the best thing the report does is draw readers’ attention to the important work already being done by the International Seafood Sustainability Foundation (ISSF) to mitigate bycatch. But where the report veers into editorializing it distorts reality and misleads readers. Take for instance a comment about the lack of “political will to achieve broad industry uptake of best practices.” While we can safely guess which of the collaborators inserted this language, it directly contradicts the report’s commendation of ISSF, which has for years been working with the industry to implement mitigation best practices, even as Greenpeace has refused a seat at the table. The report also distorts bycatch statistics in crucial ways. For instance, the standard definition of bycatch includes species that commonly end up in markets, including “undersized tuna, marlin and swordfish” (p. 8). But the report focuses instead on wildlife unrelated to fisheries, such as birds. This may stir the emotions of some of the collaborator’s donors, but it obscures the fact that bycatch rates overall are at historic lows, thanks in large part to ISSF and industry efforts. This context is important because, as is noted in the report some bycatch mitigation tactics meant to help one species could detrimentally impact another, and sustainability experts must weigh options to avoid doing more harm more than good. Meanwhile, buried in the report, and left out of the summary and press release, is a citation from ISSF noting that longline tuna fisheries only account for about twelve percent of the world tuna supply. That’s right. This 26-page report focuses only on a small fraction of the industry, and has nothing to say about skipjack, which comprises the majority of the canned tuna market. Perhaps the certain authors avoided that conversation because world tuna stocks, including skipjack levels, were deemed healthy by top researchers. The work of fisheries experts, scientists, and industry stakeholders to ensure the continued sustainability and health of global tuna stocks is ongoing, and to the extent that this report highlights and directs interested parties to that work, it’s welcome. But for collaborators with a history of hyperbole and fundraising attached to their naysaying we’ll be watching how you use… or misuse this report. Safe Catch” is here to save you… from what? The “Safe Catch” tuna brand has stoked unwarranted consumer fear for years by pitching their product as containing “the lowest mercury of any brand.” The implication, without any scientific basis, is that other brands somehow represent a genuine health risk, and that this risk justifies charging families on a budget triple the price, or more, for “safe catch” canned tuna. Indeed, the company’s very existence hinges on promoting the dangerous idea that Americans consuming a few cans of tuna a week might be at risk of mercury poisoning. Founder Sean Wittenberg claims that his own mother was poisoned by doing just that. But he presents zero evidence of any kind to support this claim. In fact, there has never been a case of mercury toxicity from the normal consumption of commercial seafood recorded in any American medical journal. Consumer mercury content standards are already extremely rigorous. Specifically, the FDA’s recommended limit for mercury in seafood has a ten-fold safety-factor built in. The FDA’s Net Effects report, which is based on 100 peer-reviewed studies, found that even a pregnant woman could eat tuna for breakfast, lunch, and dinner, every day of the week, without worry. How does your average can of tuna stack up by the numbers? Well, the FDA recommends eating fish that has less than 1.0 parts per million (ppm) mercury. Canned light tuna has 0.128 ppm and canned white tuna has 0.35 ppm, both far below the FDA’s threshold and any levels associated with harm. The truth is, Safe Catch’s business model offers a solution in search of a problem. While TechCrunch is reporting that Safe Catch Tuna is “on a mission to eradicate the risk of mercury poisoning from your fish,” they are actually contributing to a nationwide public health crisis. The nutritional and medical communities all agree that Americans desperately need to eat more fish to improve cognitive function and reduce preventable cardiac deaths. Companies like Safe Catch, which exploit mercury myths in a cynical bid to improve their competitive position, will only lead to Americans eating less fish, overall, as they worry unduly about mercury exposure. This raises serious questions about Safe Catch’s motives. The scientific consensus on mercury and seafood consumption isn’t kept under lock and key. All of this information is available via a quick Google search. So, is Safe Catch unaware of this data, or are they just accidentally misleading consumers to make a buck? Neither scenario should give consumers much comfort. Unsubstantiated claims made by unqualified parties are no substitute for sound science. Meanwhile, the empirical record is clear. There has never been an instance of mercury poisoning from normal commercial seafood consumption recorded in any American medical journal. NRDC’s failure to improperly source this claim is particularly egregious because it exacerbates a public health crisis. The organization’s recommendation that parents steer clear of tuna contradicts the Dietary Guidelines for Americans, which urge consumers to eat more fish and recommends tuna as a healthy option. Moreover, studies have found that insufficient seafood consumption is to blame for nearly 84,000 preventable deaths each year, and that seafood consumption helps ensure brain and eye development in children. In fact, A long-term study showed that children whose mothers had reduced their seafood intake during pregnancy had appreciably lower IQs. Those children missed out on key nutrients like Omega-3 fatty acids –which every major health organization says are essential for healthy brain development. The NRDC claims to be committed to using the combined expertise of lawyers, scientists, and policy experts to make the world a better place, but pieces like this suggest they’re more committed to activism than science. If they’re at all serious about accurately informing their readers, they need to immediately remove fake news from their website & commit to publishing analysis grounded in sound scientific inquiry. We’ll give Greenpeace credit for one thing—they’re flexible. When coverage of their arbitrary report on seafood sourcing among grocery retailers completely dried up, they tried to retrofit the tactic for the food service industry. When companies got wise and stopped subjecting themselves to Greenpeace’s cycle of abuse, GP stopped even pretending to seek engagement with those companies and skipped right to attacking them. And now, just a week after their latest fact-free “ranking” of major seafood brands blew it by ignorantly focusing on transshipment from purse seine boats, Greenpeace is showing its flexibility once again. It’s rehashing the same cut-and-paste attack on longline boats instead. They’re even getting the band back together, their big union allies. When one target stops cooperating, Greenpeace picks another name out of the hat. When an issue fails to resonate, they don’t ramp up their commitment to the issue… they just change issues. When they get it wrong on the facts, they just make up new facts. Maybe it’s because the substance of the attacks don’t matter to Greenpeace, only their effectiveness at driving mouse clicks to that “donate” button. But reporters, Greenpeace donors, conscientious consumers, and anyone who cares about real seafood sustainability should ask Greenpeace how they expect to be taken seriously when the fishing methods they have long advocated were just found by scientists at the University of California to have a worse environmental impact than the status quo? We know Greenpeace never did a single environmental or economic impact study on that issue, because we spent years calling on them to do so. But what about this new call to end transshipments from longline boats? Do they plan to learn from their mistakes on the FAD free campaign and actually study whether their demand is consistent with their own purported environmental priorities? We’re not going to hold our breath. We suspect Greenpeace is already at work on its next fundraising scheme, ready to roll it out whenever this one outlives its usefulness.